Meal planning saves money. This is no surprise, and when we always know the answer to the dreaded “what’s for dinner?” question, we have less stress. I don’t know about you, but more money and less stress is always a bonus in my book. 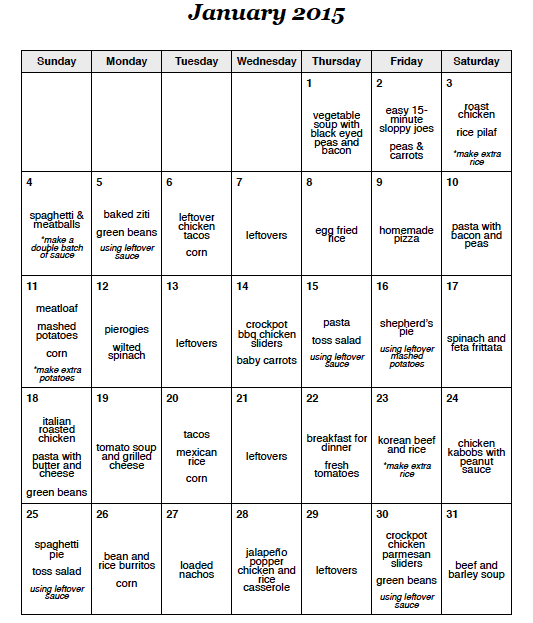 If you follow Mom’s Bistro, you’ll know about my monthly menu plans. 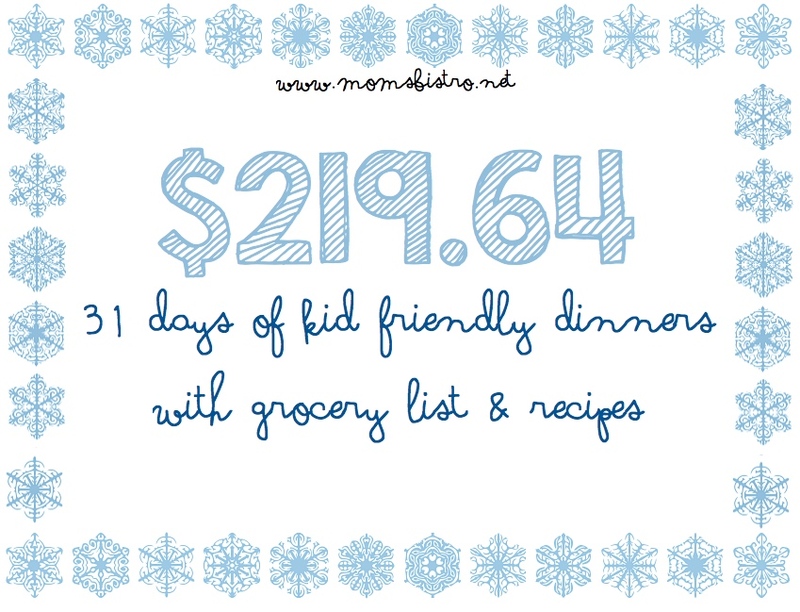 I share a month worth of no-repeat kid-friendly dinners that feed a family of four for under $200. 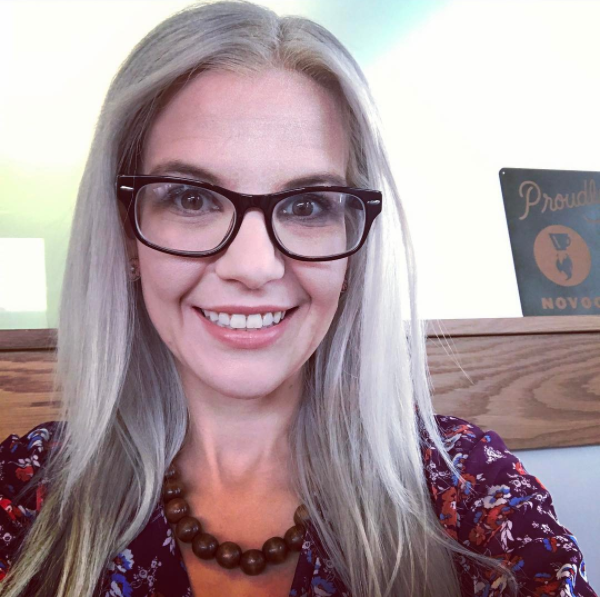 Since January, many of you have asked questions about; how I plan my meals, where I get my groceries, how I actually do the grocery shopping, and if there are printable versions of the recipes. I have taken all of your questions, and compiled them here, which I truly hope helps with your meal planning questions! Meal planning really needs to be designed around YOU. When do you get paid? When are the bills due? What does your week even look like? Are there nights when you’re not even home for dinner? All these things need to be taken into consideration when you’re planning a menu for your family. I plan meals for all 7 days of the week because our family is always home for dinner, and with our schedule, we do not eat out a lot. I also only plan meals for dinner because Anthony and I always eat at school (where I work), and DJ’s breakfast plans vary. For lunch, again, Anthony and I eat at school, and DJ, depending on his schedule will make sandwiches, or bring leftovers with him to work. When shopping, I usually hit 3-4 stores every week, and sometimes more if there is a good sale on. I optimize the weekly sales from the Wednesday paper, and use this to plan my weekly shopping trips. This is what works for our family, but yours may be different. Your meal plans are so cheap! Where do you buy your groceries? When planning my menus, I use Walmart Grocery because the cost of groceries is pretty universal across America, but when I actual shop for my groceries, I shop at all of my local grocery stores, taking advantage of all the sales! On Wednesday, the weekly sale flyers get delivered with the newspaper. If you don’t get a newspaper delivered every day, sign up with your e-mail address to your local grocery stores mailing list, and get the flyers delivered right to your inbox. They usually send your exclusive coupons too, just for joining, which will save you even more money. I also clip coupons every Sunday when I get the paper to really maximize my savings on groceries – especially since our Kroger store doubles manufacturer coupons! Cha ching! How do you buy the groceries for your monthly meal plans? All at once? Once a week? When planning my monthly menus, I create the grocery list for the entire month, because this allows me to find out the final cost of groceries for the entire month, but I actually shop weekly for my groceries, taking advantage of the sales at all of my local grocery stores and maximizing the freshness of my vegetables and fruits. However, if there is a great sale on, like this week, my local Sprouts had boneless, skinless, chicken breast on sale for $1.88 a pound, I will stock up on that item for the rest of the month. 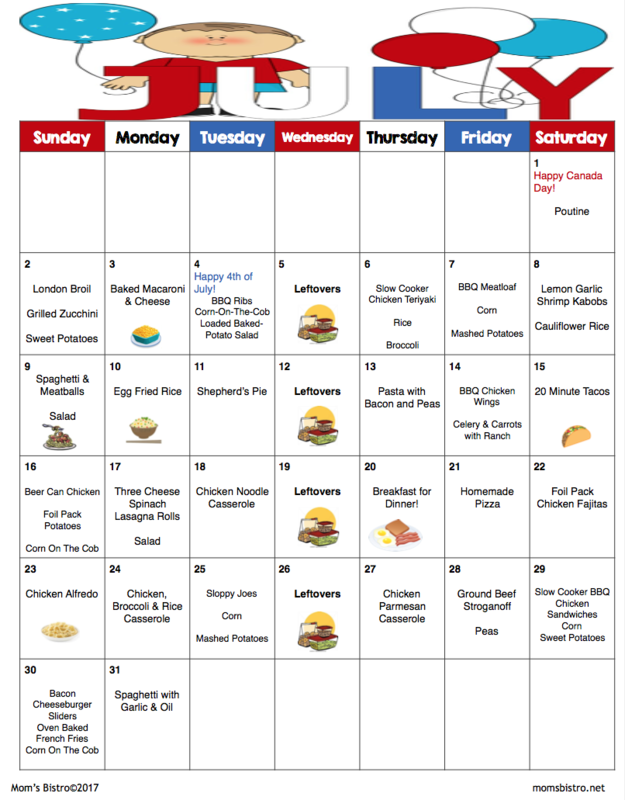 Many of you have asked for a weekly grocery list to accompany the monthly one, and the meal plan, so keep your eyes out for that in September! What do you do about breakfast and lunch? I work as the chef at the preschool that Anthony goes to, and we serve breakfast and lunch at the school, so Anthony and I eat at school, eliminating the need to plan a menu for breakfast and lunch. On the weekends, we make breakfast together, and usually add some extra bacon and eggs to the menu. If you’re looking to add breakfast and lunch to the menu, here is an example of a week of breakfast and lunches that will help keep your budget down, and your tummy full! Do you have printable recipes? Not yet! I am slowly working on adding a printable version of the recipes to each post, and to each recipe itself. I’m hoping by the end of September, this will be finished! Keep your fingers crossed, and keep your eyes open. I will also add the printable versions to past menus. Heck yes I use coupons! I clip coupons, I print coupons, and I load digital coupons to my store cards for my local grocery stores to optimize on my savings. Our local Kroger, and Safeway both have an awesome app for both my phone and tablet that I can load exclusive coupons to, and they will be applied right at checkout. It’s pretty great, and I have saved a ton of money, and the more you use your card, the more you save. The digital coupons I get now are really geared to the things I buy – like 28 oz canned tomatoes (which I use in EVERY menu plan) are only $1.07 with my coupon – saving me about $0.50 a can – when you are buying 6 cans, that’s $3 savings – and those little savings add up! Take full advantage of your store coupons, and watch the savings pile up. If you really pay close attention to your sale flyers, some stores even have double or triple coupon days. Watch those savings add up! 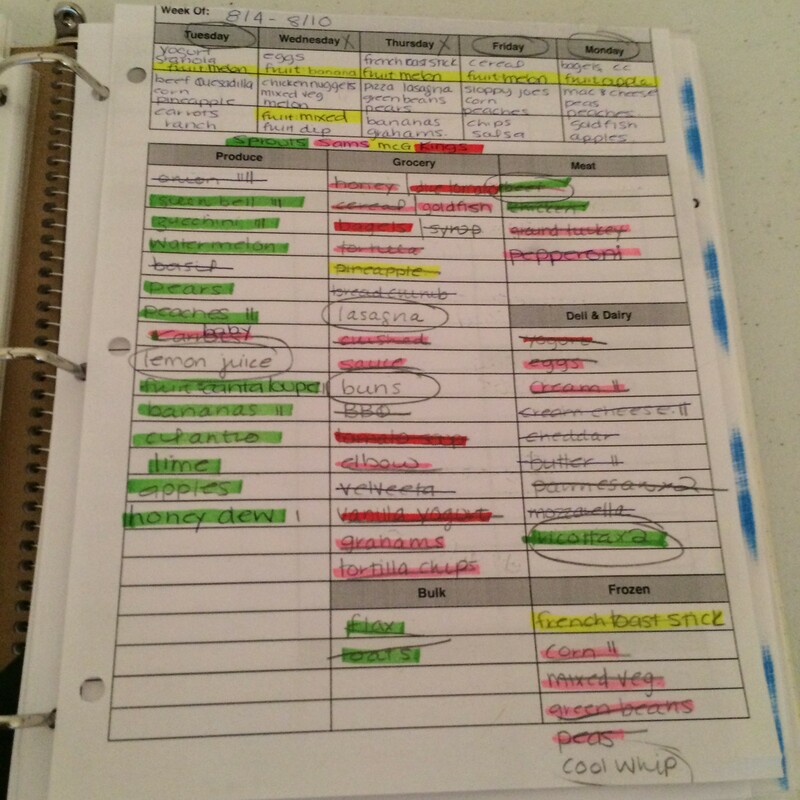 Take full control of your grocery list! First of all, don’t forget the list you created! Forgetting your grocery list is the best way to blow your grocery budget. To create a great grocery list and maximize your savings, it takes a little bit of planning and work. First start by creating a master grocery list of all of the ingredients you need for all of the dishes in your menu plan, even if you know you already have them. 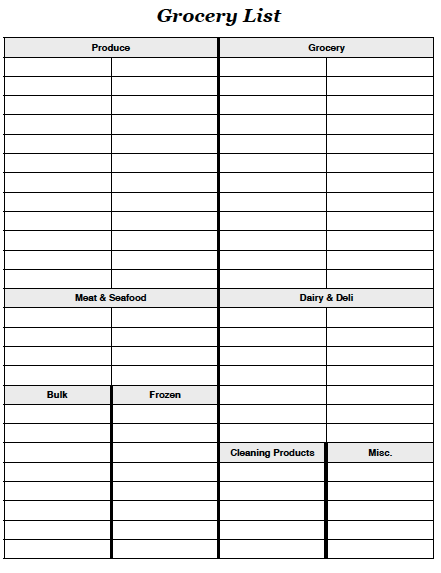 Try one of these two free printable grocery lists with meal planners. Just click for a printable PDF. Next, go shopping at home. Take a look at what you already have in your fridge, pantry and freezer, and start crossing things off of your list. After shopping at home, look at the weekly sales flyers – whether it’s on your computer, tablet, phone or with an actual flyer, and start making another list on a scrap piece of paper with the items on your menu, and the cost at each store. Once you figure out where the lowest prices are, note it on your master grocery list. I like to use different colored highlighters for each store that I will be shopping at, and the ingredients I’ll need from each store. I use the same process at school, where I plan a monthly menu, and then shop weekly! By using this grocery list, and shopping method, I have already saved my school about $350 a week on groceries while adding in more fresh produce, and eliminating processed foods. Just don’t forget your grocery list when you go shopping! If your local grocery stores have a great sale on, but run out of the advertised special, hit up customer service and get a rain check. This means that although you might not get your $0.98 a pound chicken breast this week, you can get the sale price at a later time, even if the item isn’t on sale. Check unit prices and save even more! Bring your cellphone, bust out the calculator, and do some math! This past week, for school, I bought some ricotta cheese. I was at the grocery store, looking at prices, and just was overwhelmed. There was a 32 oz container for $6.79, and a 15 oz for $2.49, an 15 oz organic container for $2.79, a 30 oz for $5.87 – and I wanted the best deal, so I did the math. Turned our that the 30 oz container, and the 15 oz organic were the same cost per ounce – about $0.18, so I got the organic variety, and just bought a couple more containers. Doing the math, and checking the unit prices on things really lets you get the most bang for your buck, and can even get you the better quality items, like the organic cheese in this case. Again, it all just takes a little bit of effort, and some planning. Now I know with kids at the grocery store, this can be tough, but I promise, the little bit of extra effort will allow for things like bribing your kids to be good and you’ll get them a treat – and you can afford to now that you’re saving so much money! Know average prices of groceries, and know what store has the lower cost of the things you buy most frequently. You’re never going to know a good deal from a terrible deal if you don’t know what the price was in the first place. Sale flyers are designed to get you in to the store to spend more money, so be cautious about where you spend, and know the difference between a good deal and a not so good one. Pay attention to the screen as your cashier checks you out to make sure that all of your digital coupons are applied, and that they are scanning the right prices! If something doesn’t seem right, tell them, and if for some reason you don’t notice it, and see it on your receipt after, head on over to customer service, and let them know. Many times you’ll get a refund on a gift card for the difference, and I’ve even had them throw on an extra $5 sometimes even $10 for the hassle. Do you have any tips on how to save money on groceries? Share them below in the comments, and help out others! This is great! Thank you! The link to the second “Week Of” list you use for your example pulls up the January Menu and Shopping list and not the blank list. I would love a copy of this one but could not find in any other place. Send me an email to lindsie@momsbistro.net and I will send you the blank list you need and an early copy of Octobers menu!